Yesterday, Jordan worked on an episode of Comedy Centrals’, “RENO 911!” As a background job, we’d normally pass; however, I Love RENO 911! I’m not proud of this. It’s a guilty pleasure and I admit it. My “rational mom reasoning” for submitting my daughter Jordan for this was threefold: (1) the scene only involved a few kids and the lead actor so it would be a “featured” bg role; 2) it’s a television show and my newbie kid had never worked television and 3) it was a short day of shooting, close to home. I was warned beforehand that the actor’s language might be a little salty. No big deal, I said. Nothing my kid hasn’t heard me scream while sitting in bumper to bumper traffic on the 101. Now, here are the things I didn’t know when I submitted her for the job: (1)There would be a deafening tire blowout on (2) a moving vehicle from (3) a gunshot blast. Now for the biggy: my child would be (4) closely chasing the moving vehicle as the gun was (5) drawn, (6) fired and the (7) tire explodes. But you know what? It was fine. Seriously. 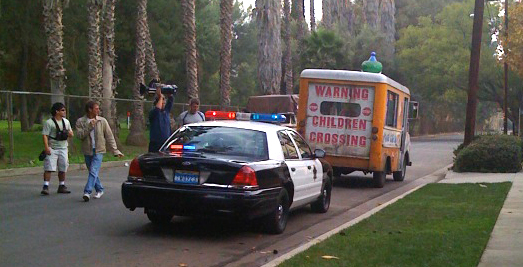 The crew was professional, the first AD thoroughly rehearsed with the kids prior to filming, an efficient prop crew provided children and parents both with protective ear plugs for the ear-popping blow-out , no one was injured, the scene was hilarious (can’t give the details yet!) and most importantly, as noted by my fellow momagers and popagers, the caterer was Fabulous.